The Dairy Science and Sanitation Workshop is tailored to dairy processing personnel and is designed to help participants understand the basic principles of dairy science and safety, as well as emphasize dairy processing establishment needs related to dairy sanitation to ensure that proper programs are conducted in their establishments. The course consists of online lecture sessions that will cover basic dairy science, including composition of milk, dairy microbiology, and dairy food safety, as well as an overview of dairy regulations. Participants will also learn in hands-on sessions the basics of cleaning and sanitizing principles, unit operations -- both raw milk production and receiving, and dairy processing, plant equipment and design, general control of pathogenic and spoilage microorganisms, in depth information on cleaning and sanitizing chemicals, their properties and applications, and a discussion on CIP and COP systems and common errors seen in the industry. 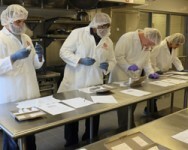 The course also provides hands-on sessions where both CIP and COP principles will be applied. Instruction is provided by Anika Zuber, Dairy Processing Specialist with CCE Harvest NY, and Omar Oyarzabal, Extension Associate Professor, Food Safety Specialist, University of Vermont. $725 registration fee. Registrations must be received by May 8 and the course is limited to the first 15 registrants.